Are you getting bored of the same old wines? 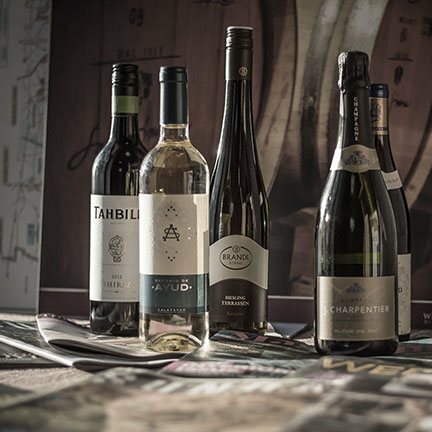 Join the Wine Explorers Club and get 6 exclusive wines delivered to your door every month. Just choose your level and whether you want a red, white or mixed case. Then we scour the globe to find new artisan wines for you to explore. Every month, 6 carefully curated bottles will appear; each with its own tasting notes, food pairings and information about the winemaker. Even better, every quarter you get a Free Upgrade to your wine worth €20. Great wine starts here. Red, white or mixed cases are available at every level. Remember, you'll get upgraded to the next level up every third month! Start your wine exploration with our best value bottles. Superb value and quality from the best independent vineyards. Enjoy a premium selection of wines every month. You know whether you're getting a red, white or mixed case but the wines are a mystery until your case arrives. Once you choose your level, what you pay never changes, but what you get is never the same! "The idea of the Wine Explorers Club, is one of Wines Direct's best: a monthly delivery of new discoveries culled from around the globe, pitched at different price levels. This is the equivalent of being out there in the vineyards with the Keogh family and their producers, picking up the marl, feeling the breezes, watching the arc of the sun of the aspect of the vineyard, tasting from the barrique, feeling the culture of the vine."